Firm and supportive, our handmade buckwheat hull pillows naturally conform to your body to offer natural support. Encased in soft and durable organic cotton twill, these pillows offer fantastic air circulation, keeping you cool all night long. Available in sizes from travel to king size pillows, White Lotus Home carries a buckwheat hull pillow for everyone. Buckwheat hulls are the shells derived from buckwheat plants. Naturally resistant to pests and competitive with weeds, buckwheats are a sustainable crop to grow and require very little input from the land to mature. We source organic buckwheat hulls to ensure our happy customers never come into contact with pesticides in their pillows. Not sure how firm you like your pillows? Get your pillow with a zippered case, and add and remove filling to suit your own preferences. Simply store any excess material in a moisture and pest-proof container, or order more buckwheat from our Wholesale Fibers section. NEED HELP SELECTING THE RIGHT NATURAL PILLOW FOR YOU? Check out this Blog post on "How to Find the PERFECT PILLOW" and our White Lotus Home videos have some great details. The Organic Cotton Twill fabric used in this product is GOTS Certified and Imported. All orders from White Lotus Home ship FREE in the contiguous United States. If your order qualifies, our dedicated Dream Team will reach out to you at least 3 days before your tentative delivery date. To see if you qualify for our White Glove Delivery Service, click here. Larger orders may need to ship via freight services. We always recommend spot cleaning our pillows — never saturate them with any liquid. We always recommend to our customers that they add one of our protective Barrier Cloth pillow covers, to ensure spills never get out of hand. To spot clean, we suggest a mild solution of three parts water to one part vinegar in a spray bottle, but for particularly stubborn spills, a mild detergent is perfectly fine to add to the bottle as well. Always ensure your pillow is thoroughly dried after a spot cleaning, either by using a hair dryer or placing it in the sun to air out. TOTALLY DELIGHTED!!! I'm a side-sleeper and was bunching up the pillow I was using to give me the neck support I needed. I happened upon this site, and I'm so glad I did! I was unsure what size buckwheat pillow to get as a replacement, so I ordered both Junior and Standard sizes, along with the Barrier Cloth Cases, all with the zipper feature. I needed to call Customer Support with a couple questions, and the woman I spoke with was very helpful. I'm now using the Junior pillow on top of the Standard size pillow, and it's giving me the perfect amount of height and support I need. And no more waking up with headaches! I LOVE these pillows. I have one or two in every place I sleep (my own home, my parent's, my boyfriend's). These are so well made, so sturdy, I can feel the care and attention that went into the making of them, and I just love knowing they are high quality, organic, healthy. Cradles my head and neck perfectly, and lasts a REALLY long time. I'd look up how to use them before ordering. They're not typical pillows, so I'm still unsure how to get mine to be comfortable. \n\nAlso, don't cheap out: include the zipper in your order. Chances are you'll want to make adjustments to how stuffed it is. Much larger than typical pillows on the market with more than ample fill. I would recommend this product. I've been sleeping on this pillow for years and can't say enough good things about it. It seems to fit my head and align my neck perfectly. It is heavy for travel but worth it if you can fit it in your suitcase. 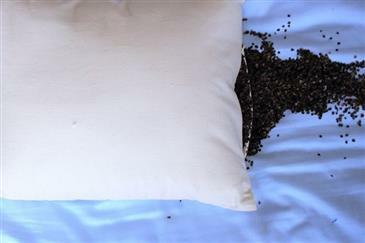 The buckwheat sleep pillows are not your average pillow. The sheer weight of it initially was a bit startling. That being said, you're not going to need to stack pillows like you may have in the past. Which is good, because you can't just toss this thing off of the bed. It is a good, sturdy pillow. The buckwheat contours to you and stays that way. The casing is high quality and super soft as well. I ordered mine with the zipper case and that has come in handy. Hi there, What is the weight of the buckwheat pillow 16x19? Is the organic cotton free of dye? Is it soft to the touch? Can I wash the pillow case? What's your return policy? How long does it take to ship to California? Thank you for your help in answering my questions in advance. You can review weights of all other sizes on the DETAILS tab. Shipping to California may be about 4-5 business days but we do not charge to ship to the contiguous USA! We hope this is helpful but we do hope you reach back out to us with any further questions or concerns!